Storefronts, grand old hotels, imposing buildings, a glasshouse, big trees … can you identify the places around Perth on a larger-than-life glass hare? The images take you back in time to a Perth of days gone by. Get really close, the details of a hotel lobby stand out, from a distance the hare takes on a personality, the sight of battling hares in the fields of Perthshire. 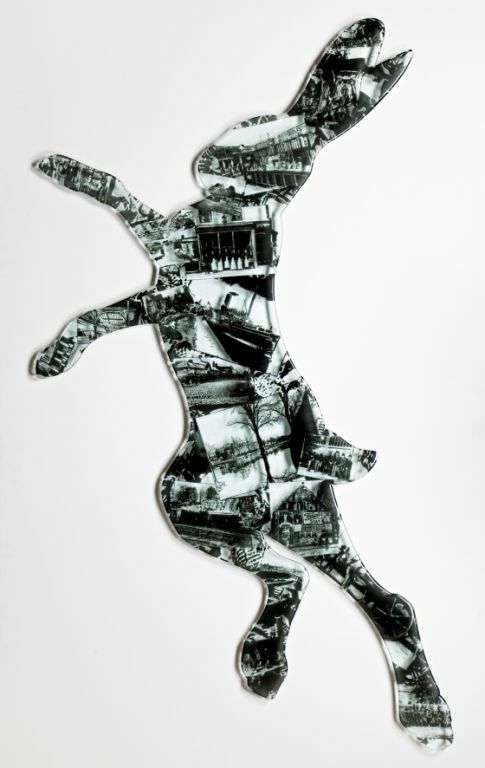 The Perth Hare, or Glare, is a unique piece, twinning this iconic local creature with the historic images of the city itself. Always popular with our visitors, it forms the centrepiece of Dazzle, the current exhibition at Perth Museum and Art Gallery. Like Cook’s Collection by James Maskrey, which was the subject of a previous post From Australasia – Antarctica (via Perth Museum and Art Gallery), Glare was created for the exhibition Trove, a collaboration with the Scottish Glass Society. Invited artists created new works inspired by artefacts from the museum’s reserve collection. Glare draws on both the natural history collection and the Magnus Jackson Photography collection. In creating it, Rachel Elliott incorporated several pioneering elements; it was the first time she had used the technique of water-jet cutting, the first time she had worked on such a large single piece of glass and the first time she had screen-printed kiln-fired enamels on this scale. 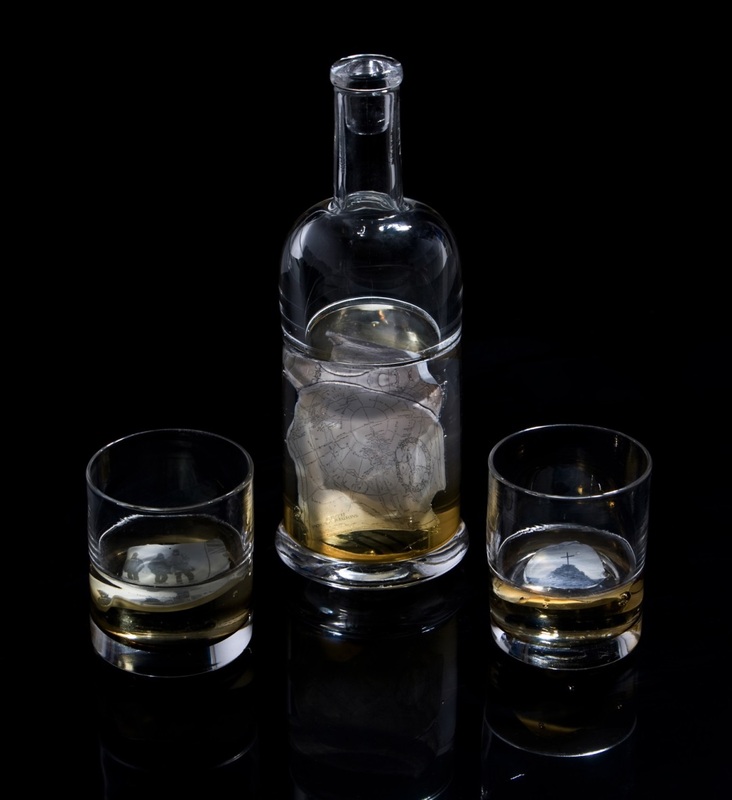 The glass collection at Perth Museum and Art Gallery is a Recognised Collection of National Significance based on the history of glass production in Perthshire; Glare is part of an initiative to extend the collection with examples of glass by contemporary makers. 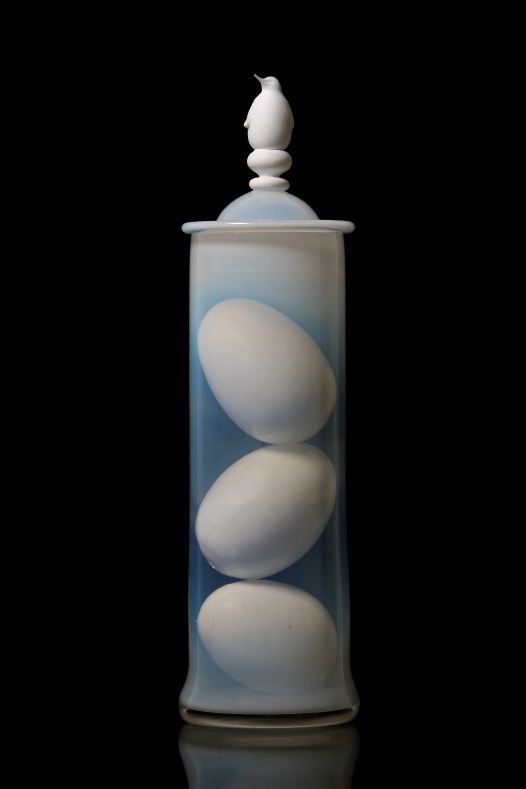 Free blown and sculpted hot glass, Cook’s Collection, 2010, by James Maskrey, acquired by Perth Museum and Art Gallery in 2012 with an NFA grant of £765. In March 2011 the Scottish Glass Society and Perth & Kinross Council presented Trove, a contemporary glass exhibition showcasing the work of 25 emerging and established glass artists who were invited to create new artworks that revealed the hidden treasure in Perth Museum and Art Gallery’s reserve collection. Following some research and a subsequent installation at the Captain Cook Memorial Museum in Whitby I wanted to further research Cook’s voyages and was overjoyed to discover a first edition of Cook’s Journals in the Perth collection. Through further investigation and my continued relationship with the Captain Cook Memorial Museum I discovered that Cook developed quite an original approach to diet and as a result his crew rarely suffered from the effects of malnutrition, namely scurvy, the debilitating disease that was the curse of seafarers. He utilised locally sourced and seasonal foodstuffs on his travels as well as vitamin rich ‘anti-scorbutic’ concoctions he brought from home. 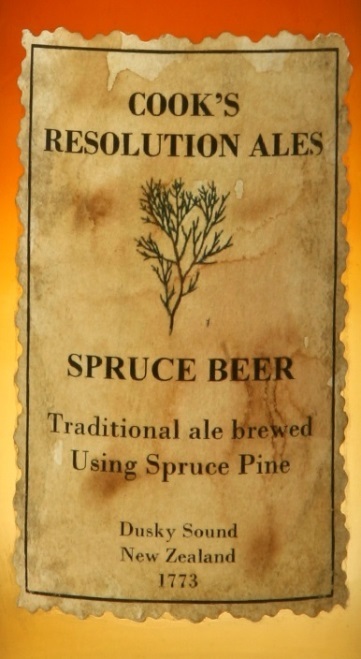 Interestingly, he was also the first known person to brew beer in New Zealand. Cook’s Dietary Curiosities is a celebration of this, a menagerie of factual and imagined curiosities collected by Cook before and during his voyages. All the work was made using traditional methods of glass blowing from the furnace. Jars, lids and contents were all free-blown and sculpted by hand using hot glass techniques. The labels were designed, printed and distressed, some sourcing original drawings by Joseph Banks, the botanist onboard Cook’s first voyage and utilising similar typeface of the period. Such is my love of the creative process that every part of the procedure was completed personally. Subsequent pieces have concentrated on the factual with the odd red herring, the joy being that the viewer may find it difficult to distinguish between fact and fiction. On closer scrutiny, however, they would discover that it is nearly all fact. Cook’s Collection now extends to nearly 20 individual pieces. This body of work has since found a completely new direction. Through further research I learned that Cook was the first person to cross the Antarctic Circle, discovering the South Sandwich Islands and mapping South Georgia. This gave rise to speculation about the existence of a ‘Great Southern continent’ (Antarctica). Subsequent work over the past three years has evolved into a narrative of the heroic age of Antarctic exploration. All these works (from Cook to Antarctica) aim to celebrate, capture and preserve. They have been shown widely in the UK, Europe, China and the USA and pieces from the series have since been acquired by the Victoria and Albert Museum and the Crafts Council. I feel privileged to have been selected for Trove and I’m indebted to the Scottish Glass Society and Perth Museum and Art Gallery for the opportunity. Much of the development and subsequent success of the work has been down to the original subject matter and research conducted for the exhibition and in the collection at Perth Museum and Art Gallery.